What does it mean to have a fixed mindset? Have you ever felt like you had to give up because you didn’t have the ability to solve a problem? Has your child ever quit an activity or a sport? What was your response to these scenarios? When you give yourself the option that you don’t have the ability to handle a problem you are setting a model for future scenarios. When children are given the option to quit, if they believe they will not immediately excel, they will continue to perform this learned pattern throughout their life. How they handle the struggle may determine their future success in academics, sports, and future careers. Recent research has shown that someone with a fixed mindset is more focused on the judgment that is made about their actions. They want to prove that they have the ability to do something, but if they do not have that ability they are more likely to avoid the situation where they do not expect to be successful. The outcome is the only thing that matters, not the process. Individuals need to know that the intelligence they are born with is not fixed but has great potential and grows as they get older with their new experiences and insight into problem-solving. With the thought that skills can be managed and improved, and are not stagnate, adults, teenagers, and children can understand that they have greater potential. 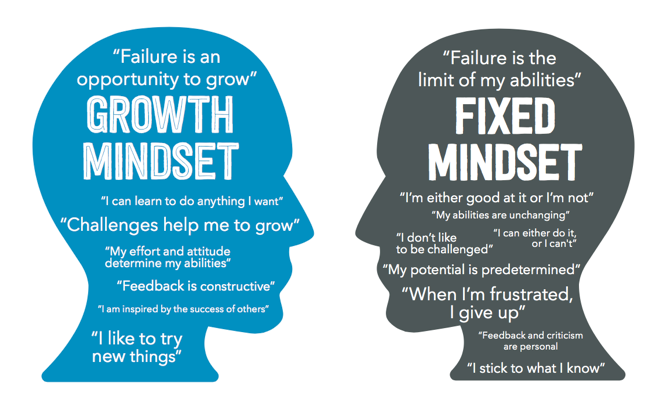 Someone with a growth mindset will turn towards problem-solving when confronted with a challenge. By incorporating a problem-solving mindset you can outperform your peers and help your children with future skills to outperform their peers. Instead of a mistake stopping you and hindering you from moving forward, you will begin to learn from the mistake and keep moving forward. Come join us at the Reducing Stress and Achieving the Right Mindsets for Yourself and Your Child workshop on Saturday, April 13th to learn more about fixed and growth mindsets and additional ways to aid in your own growth and your child’s success in and out of the classroom. What Does Cell Phone Addiction Look Like? Are you in touch with your Authentic Self? Is Someone You Love Struggling With Addiction? Lovingly Supportive or Loving Someone to Death – What is Enabling?